Aluminum-free deodorant. It's one of those things that I know is probably better for me than conventional deodorant...but I worry about effectiveness. After all, I do live in hot, unbearably humid Florida. And I do not want to walk around smelling like BO with a side of generic floral scent. Nor do I want to sport wet spots on the underarms of my top. So, needless to say, I was VERY skeptical about trying an aluminum-free deodorant. BUT I do have a family history of cancer and I figured...anything I can do that even MAY be able to tilt the scale in my favor in the slightest would be worth a try. So why did I choose Native? Honestly, because of the reviews. I looked on Facebook, Instagram, Twitter, various blogs and review sites and a large majority of the reviews were accounts of positive experiences. And importantly, accounts of Native deodorant actually being effective. 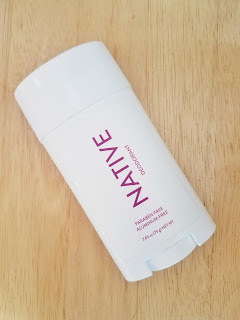 I didn't see any accounts of Native giving its users a painful rash (like I had with all of Schmidt's deodorant) so I decided to give a try. Now, I know... When you've been paying around $3 or $4 for an antiperspirant and suddenly see a $12 price tag for a stick of deodorant... it can be a little surprising. But I paid the money figuring that if this deodorant actually works without having aluminum in it... it would be worth it. The first scent I chose was Almond & Vanilla (a seasonal scent). I don't know what I was expecting (I guess something like an almond or vanilla body wash/soap scent), but it smelled a lot like cake batter. Definitely not a bad scent, but I wasn't sure I wanted my deodorant to smell like cake. I used it (the scent actually smelled much more vanilla-y when on) and hoped for the best. Do you know what happened? It worked! No stinky body odor. And no unwanted moisture. I continued to wear it and discovered that if the temperature went above 80 or 85 degrees, my underarms were definitely not completely dry. They were less sweaty than they normally are when I forget to wear deodorant (the worst!) And still, even with sweat, not stinky. At all. Believe me, I checked. After using this deodorant for a month or so, I was able to stop wearing deodorant at night. Typically, I sweat a bit in my sleep. But I found that now without deodorant, even if I had sweated overnight, there was no evidence of it in the morning. No smell. No wet underarms of my PJ shirt. I don't really understand HOW that's happened. But it has. I finished the Almond & Vanilla scent and ordered the Lavender & Rose. Much more my speed with the scent being heavy (in the best way) on the lavender. I'm still using the deodorant today and I don't plan on going back to my "conventional" deodorant until the temperature starts getting into the high 80s. Why? Because, as much as I love this deodorant, I really don't think it will be able to stand up to a Florida summer. It's too hot (90 - 100-degree temps). Too humid. And often too much for many deodorants- even those with aluminum. But, I will plan on wearing Native until our hellscape of a summer arrives. Also no rash, no irritation, no discoloration (on my skin or clothing), and no side effects. So I definitely recommend Native!